Philosophy - Leber Jeweler Inc.
Quality and conscience are not mutually exclusive. We know that the choices we make can affect our planet and unseen people in countries far away. 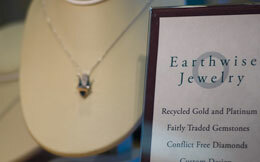 Joanne and Brian Leber, the designers of Earthwise Jewelry®, feel a responsibility to the planet and its inhabitants. As artisans, we have uncompromising standards for design and craftsmanship. We are committed to the highest level of service for our clients and believe it is the human element in jewelry that has the power to create the extraordinary. The guiding principles behind our Earthwise Jewelry® Collection insure that, as a symbol of love and commitment, fine jewelry can be both beautiful and serve a greater good. Our company believes in a strong connection to the people throughout the world whose land and labor provides us with the natural materials we use. We care deeply about the rights of all living things. We have an abiding respect for nature and its gifts. We choose recycled precious metals and responsibly sourced gemstones to help preserve and protect our earth’s natural resources.